Our mission and guarantee is only one thing! We GO towards designing and developing WEBsites with enriching customisation to make it EASY for all our clients’ businesses to successfully reach their successful potentials on the Internet. GoWebEz is a dynamic and innovative web design and development agency since its inception in 2014. Our development centre is based in the liveliest location of the South of India. In Chennai! 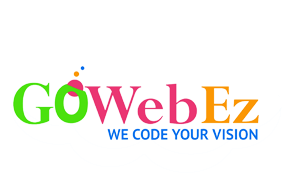 At GoWebEz, we have experts specialized in web design, web development, CMS, e-commerce, SEO, and data entry. We have elevated numerous businesses, trifling and enormous, develop an influential online presence, magnetize new traffic, expand customer engagement and increase sales. And we could do the equivalent for YOU. GoWebEz draws clients closer to their websites and their websites closer to everyone else, so that business owners and organization leaders can focus on what’s important...bringing their vision to life! At GoWebEz, we not only recruit great designers; we hire fluent marketers with the right attitude. Our designers and marketers are easy to work with. We aim to answer your questions before you've even asked them. Our designer's potential performance is ensured through frequent coaching sessions and salary appraisals. We understand that your time is precious. Hire us and we'll let you focus on your business. Our developers focus on your end user's perspective. User-friendly software : business success. Senior project leaders and architects do frequent design and code reviews to ensure scalability,security and speed. We dive deep to understand and identify your requirements. Here are key advantages we offer to our customers. We work with massive precaution – to design, deliver and upkeep high-performing web solutions that enhance you a significant business advantage. Our objective is to deliver user experience that can turn your business into obtaining more providential users and escalate your conversion rate. Acquiring your customers to convert means cracking their problems, illuminating your story and increasing reliance. The UI/UX department functions diligently with software product development experienced in inventing web solutions on many heaps. We understand development process and design implementation and we do not design something that is impossible to produce. Our extensive experience includes web, mobile and tablet development. We provide UI/UX services for a wide range of products from games to VOIP, ordering programs and social networks. Our goal is to provide user experience that can turn your business into more lucky users and increase your conversion rate. Getting your customers to convert means solving their problems, telling your story and increasing trust. The UI/UX department works closely with software product development experienced in creating products on many stacks. We understand development process and design implementation and we do not design something that is impossible to produce.